If you’ve strolled down the tool aisles at Sears anytime in the past year or two, you probably noticed that most of their sockets are now laser-etched. Other manufacturers are jumping on the bandwagon — and they’re quick to praise their laser-etched sockets as being easier to read than traditionally labeled sockets. In another post, TM reader Teacher suggests these laser-etched sockets aren’t all they’re cracked up to be. If you had to choose, which socket would you buy today – one that’s laser-etched, or one that’s mechanically engraved or stamped? Let us what you think in comments. Hmm…stamped because the markings will never wear away, or laser etched because it’s bigger and easier to read. I think I’ve got to go with the Laser etched. I usually can’t see anything when I’m under the car, and anything that makes reading the sizes easier gets a thumbs up from me. Laser etched is really nice. I have some really old stamped sockets that are very hard to read because they are old. I agree with der5er, it is much easier to read when you are under a car and trying to get the right socket. Laser-etched FTW. Not sure how they wouldn’t be “all they’re cracked up to be”. Maybe scared of change? A lot easier to read, as long as it’s durable…I’d take those. Disclaimer: I haven’t actually used the laser-etched sockets. I would think the laser-etched sockets would be preferable, because even the stamping can wear flat after a LOT of use. I have some really old sockets whose lettering is very nearly worn flat. I’m not sure how long the laser etching would last in comparison, though it does seem like it would be a lot easier to read as long as it’s not worn off. I’m unlikely to buy any new sockets – but the laser-etched ones would work better with my 60 year old eyes (my arms are too short to hold things far enough away to read – without glasses). I can’t remember, however, when I last looked at the size on a socket. I usually eyeball the fastener and the socket opening, try some logic to decide if its likely to be metric or inch measure – and then try them on for fit. I’m usually right on the first (or at least the second) try – although a old British piece of junk with Whitworth Standard Fasteners (19/32 and 25/32) fooled me a while back. You can find stickers online where you can place on your existing sockets. Don’t know how well the stickers hold up but its better then having to change out all of your sockets. I have used the stickers,the are not worth while.They wear of very guickly!! I like the laser etched ones quite a bit, but honestly, I don’t have much of a preference. The way craftsman sockets seem to be made these days, I bet they’ll break before their worn clean of their markings. I keep my big socket set in the original case all organized-like so socket selection doesn’t usually involve reading the socket itself. Laser Etched is certainly hot. Not for the reason that you’d think. I was able to snag a nearly new set of traditionally labeled sockets for a song because a local tool-aholic had to upgrade. Works for my 27 year old eyes and budget. Laser etching is here to stay because it is better. Laser etching sets the symbols to mark with software. There is no mechanical setup to change what is printed. Everything coming down the line can get different markings if that’s what you need. The marking is done non contact so there is no mechanical wear on the machinery. Laser marking can be used on materials that can’t be stamped. Going from stamps to laser etching is like going from individually set type to laser printers. That’s a two hundred year leap in technology. Been there before with all this when Smith and Wesson started using laser etching on some of their guns. Old fogeys (of all ages) don’t like change. Just my two cents but after having laid under a vehicle in semi-bad light, upside down and with grease all over everything I find that this is not the time I would pick to play “find the right sized socket.” I hate that. So I am defiantly going with HOT here. If I need to buy a new set of etched sockets 10 years down the road for the convenience I will. I’ve used this on my metric sockets and combination wrenches and once you remember the connection between the color and the size, it’s great. Also the tape doesn’t get as torn up as you’d think, plus you can just put on a new piece tape when it does. Leslie, Sheldon’s method has been discussed here before. Personally, I believe that his system has merit, but I choose not to use it for various reasons. The only problem I have with the laser etchings is that they’re a little hard to read at times. I’ll know more when I really get them filthy. Got both, mostly old, stamped. Can’t afford to replace the old ones. There’s no question the laser etched are the way to go. Like some others have mentioned, I joined the bi-focal crowd some years back and can use all the help I can get. Back in the day, my old Chevy was pretty much all 1/2, 9/16 and 5/8 fasteners. Not any more. Don’t have the eye I used to, especially for metrics. I think you can do one up on the laser-etching by coloring the laser etchings with a felt tip marker or some machinist layout dye. You might get lucky and the ink will wipe off of the chrome areas, but remain in the rough etched areas giving a professional look. Doesn’t really matter to me. I’m a factory certified grease monkey and use my tools day in and day out (except for Sunday since the dealer is closed). Anywho, my Craftsman sockets were purchased as kits and come in really nice plastic trays, each tool has it’s own place that is snaps into and keep them in order. So I know where each size is based on it’s location (and that the 10mm is very dull compaired to the rest of the sockets). Those plastic trays that Craftsman sockets come in are the best way to keep your sockets in place and in time you just learn what size is where… no need to read anything. But in the end, I think laser is better because is will keep the cost down. Now if I had to ever have both metric AND standard sockets, and I kept my sockets loose in a tray, then at least with Craftsman, the stamped sockets have the marks along the bottom edge. But which one of you above just have your sockets rolling around in a tray? Don’t you people have something that holds each socket in a given location (rails or pegs or whatever)? They look better than both laser marked and traditional stamping, and I’d guess that you could tell a socket’s size by touch. Don’t know about the cost. Any German readers here can find out? I say VERY HOT! They could make it better though if the size was stamped multiple times around the socket. That way, no matter how they roll there will always be numbers facing the user. With the size available for marking, only a company like ‘KS’ can brand the socket like that. Any other company that used that design would have to do size marking all the way around, because they couldn’t fit ‘Craftsman’ or ‘Stanley’ in that space. Either way, it doesn’t look like those sockets will roll at all, so you could always put it down with the size up. Laser etched is TOTALLY HOT. Anything that makes it easier to read when you’re rummaging around in a drawer full of sockets with greasy, dirty fingers is a winner to me. And like it was stated above, if it’s a Craftsman socket, take it back and get a brand new one if it ever goes kaput. 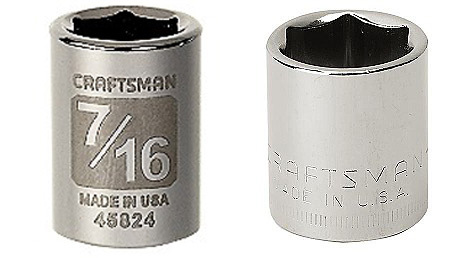 Has anyone ever tried to return a Craftsman socket because the laser marking had worn away? Will Sears swap tools because of unreadable marking? My experience is that laser etching can be unreadable when dirty and wears out way fast depending on the depth of the etching. Also when it comes to sockets and wrenches , I use them so much that I can tell what size I have without looking for the stamp or etch. In the past I have returned craftsman sockets that had the size worn off,ground off,beat off , etc. No Problem. Not sure about these days, im talking at least 15 yrs ago. Think about it: laser tag, laser surgery, laser guns(!). The Laserdisc fiasco of 1981 notwithstanding, lasers are always better. I bought of set of these and I can tell you, Laser-etched sockets are da bomb. Regrettably, I don’t have the supersocket powers that Kevin does, so I need to actually read the size (or spend a frustrated few minutes trying each socket until I find the right fit). And Karl makes a good point – If the labeling wears away, I’d bet Sears would replace them. I’m not a pro, so no offense to those who are, but I’m curious where some of the guys in the above entries work. Sockets so dirty you can’t read them? I’ve worked on some funky machines in the past, but never so bad I couldn’t read socket sizes, stamped or etched. And the last thing you’re supposed to do at the end of the day is wipe any dirt or grease off the tools and put them away. If I’m off base on this, would someone please explain? Just about any sizable job involving anything other than the top of an engine is going to get your tools too dirty or greasy to read before you complete the job. I’m an industrial mech at a very large ethanol plant and I work nights. Neither stamping or etching is completely adequate but at least none of the stamped tools have worn off their sizes. I have complete sets of Armstrong and Craftsman sockets with hardly any laser markings left on them. Those KS tools look sharp but I bet they’re not available in standard sizes. I would love to see a toolmaker come out with a set of black oxide coated sockets with the size stamped on the back end and the stamping filled with white plastic – that way I could set the sockets down without them rolling away or getting filled with debris and still be able to read them in the near darkness. Having the etching wearing off has become a bit on the frusterting side. Ive taken them back but it was worn off so much I got the wrong socket. If you look now days they have both stamping and etching thank god im not the only one that has taken them back. I HAVE THESE LASER ETCHED SOCKETS AT SCHOOL FOR STUDENTS AND IT WEARS OFF. HARD TO READ.